Immigration officers have been told not to deport foreign students who overstay their visas, unless they have broken other laws, a leaked memo reveals. The Border and Immigration Agency memo, obtained by the Daily Mail, was written after the agency's head intervened to stop a student's removal last month. Chief executive Lin Homer stressed if there was evidence of corruption or fraud, students would still be removed. The Tories said a blind eye was being turned to those with no right to stay. In the memo to regional directors at the BIA, director of enforcement Jonathan Lindley said a law change from 1 September 2007 had led to a rise in the number of refusals for students who apply to stay in the UK after their visas have expired. Applicants who are out of time, even by just one day, are automatically refused a further stay and this had led to some "enforced" removals, the memo said. One removal came to the attention of the chief executive and was "cancelled", it added. Mr Lindley wrote: "I am surprised that any of these cases have come sufficiently high within enforcement teams' priorities to merit such quick removal action." He said the policy on dealing with out-of-time applications was currently under review and asked that officers did not proceed with enforcing any student refusal cases unless "deemed to be a priority". 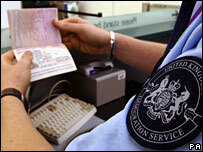 Thousands of foreigners come to study in the UK each year. Ms Homer told BBC Radio 5 Live that the advice was triggered by the case of a Chinese student at university in Manchester who applied to extend her leave in time but got her bank details wrong, so had to resubmit her application. "She corrected and sent us another form of payment, actually an old fashioned postal order, which arrived a day or two after her leave expired and because of a toughening up of the rules that was refused and enforcement action was taken - now that seemed to me to be us taking our toughness a stage too far," Ms Homer said. John Tincey, of the Immigration Service Union, said the memo was "astonishing" and told 5 Live the main priorities were removing foreign national prisoners, followed by failed asylum seekers. He said: "In an ideal world the Home Office would have enough money and enough immigration officers to actually go after everybody who shouldn't be in the country. "But the Home Office estimates there are some 600,000 people in the country illegally - to look for those people we have less than 1,500 immigration officers, so basically priorities have to be set." Shadow home secretary David Davis said: "It is astonishing that warped government priorities are dictating that our immigration authorities turn a blind eye to those with no right to stay in the UK. "These revelations reflect the continued chaos at the BIA, which is already struggling to deport foreign prisoners and remove hundreds of thousands of failed asylum seekers who are in the UK illegally."